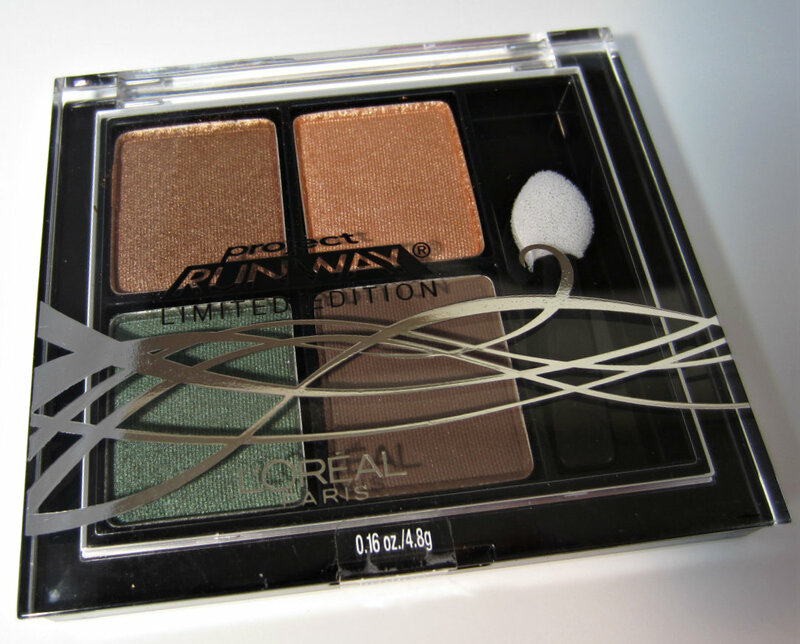 There are four different sets in this year's Project Runway Collection from L'Oreal, and after hitting up several Walgreens, I found one that had all four in stock. A couple of the Walgreens I went to only had one set out, so I knew I had to keep looking! Here's a look at all of the collections, courtesy of Racked.com. These are BOGO 50% off this week at Walgreen's, so I picked up a range of products that I thought looked interesting, and I've got nail swatches and product pictures for you today. 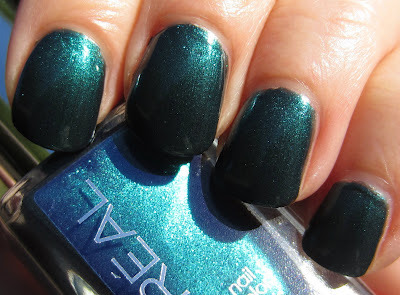 The Muse's Attitude, shown indoors above and outdoors below, is a beautiful teal shimmer. A deep charcoal base adds to the depth of this shade, and the formula was fantastic. I used two coats and no top coat in these photos. 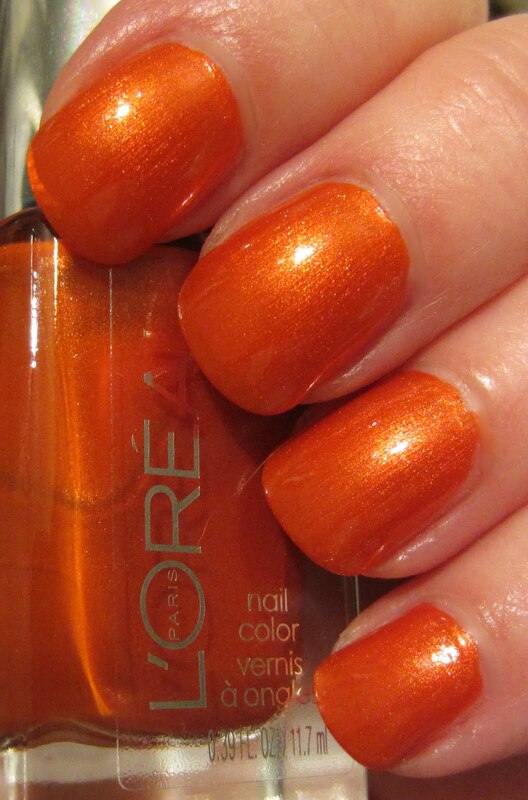 The Muse's Inspiration, a burnt orange or tangerine shade, is also a shimmer. This one also had a great formula, and I think I could get away with just one coat, but I used two coats in this photo. I love how this one seems to glow. The Temptress' Power is a champagne hue with aqua greenish/blue shimmer. 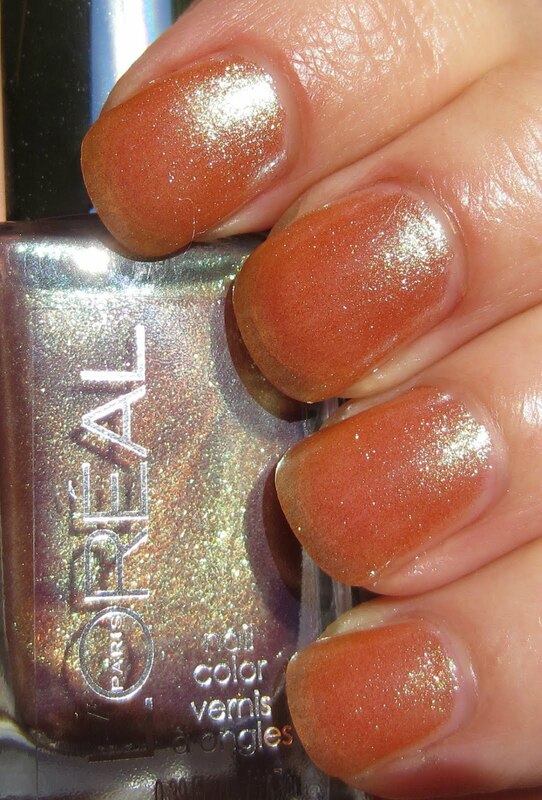 It looks like it has a touch of duo chrome in the bottle, but I wouldn't say that the look transfers to the nail. Shown indoors above, and outdoors below, you can see that two coats gives sparse coverage. 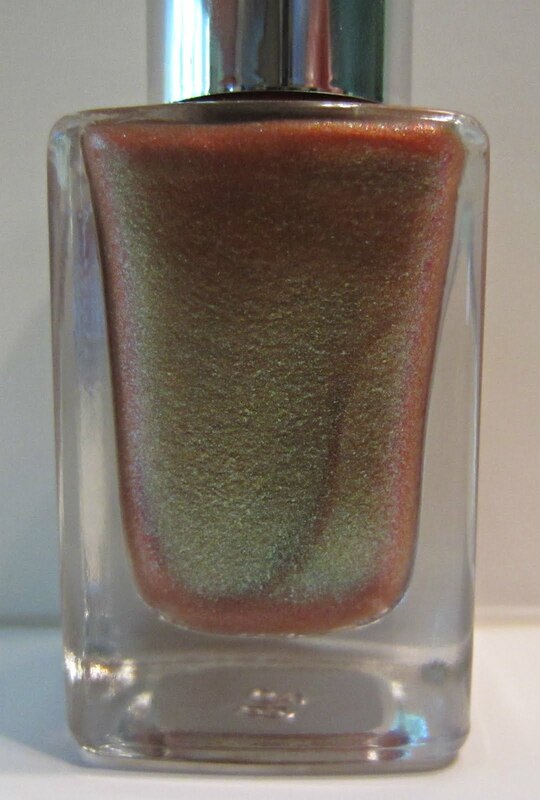 Don't discount this shade though, because I used it over several darker shades on a nail wheel, and it's a beautiful polish transformer when used that way. 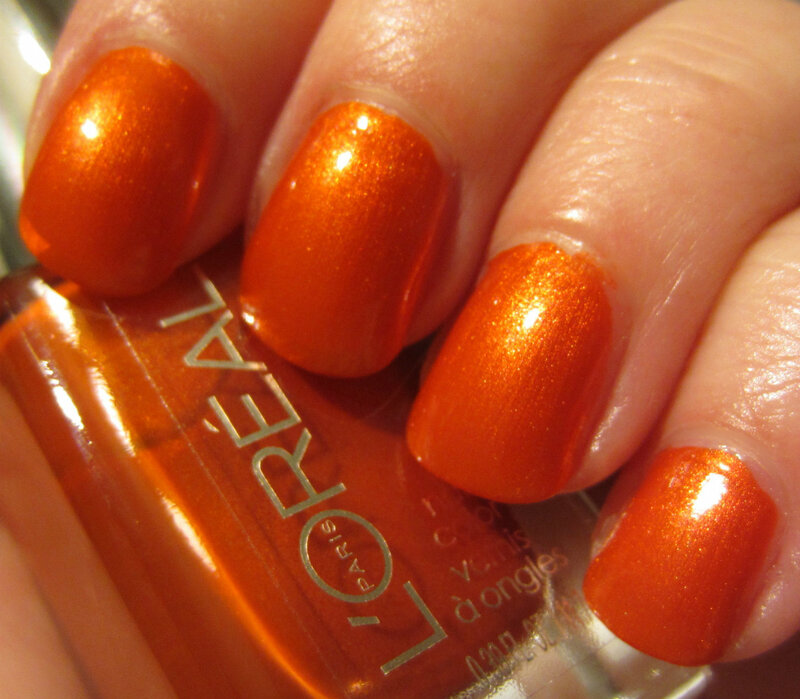 It looks so pretty in the bottle, doesn't it? Below is a group shot of what I picked up from this collection. 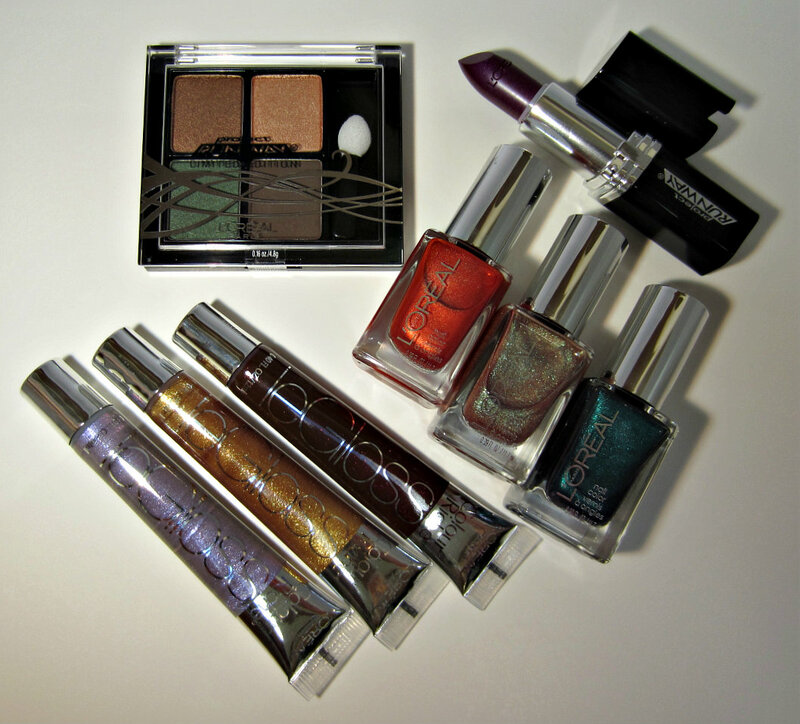 I'm obsessed with the dark vampy lip trend this Fall, so I'm anxious to try out The Mystic's Kiss and The Queen's Shine. 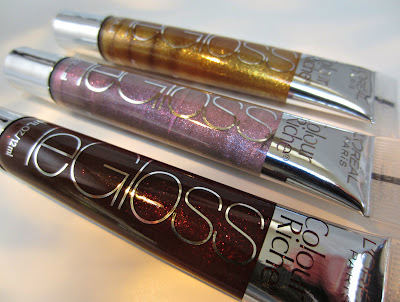 I'll be doing a post next week sharing my favorite lip shades for Fall, and these will likely be included. 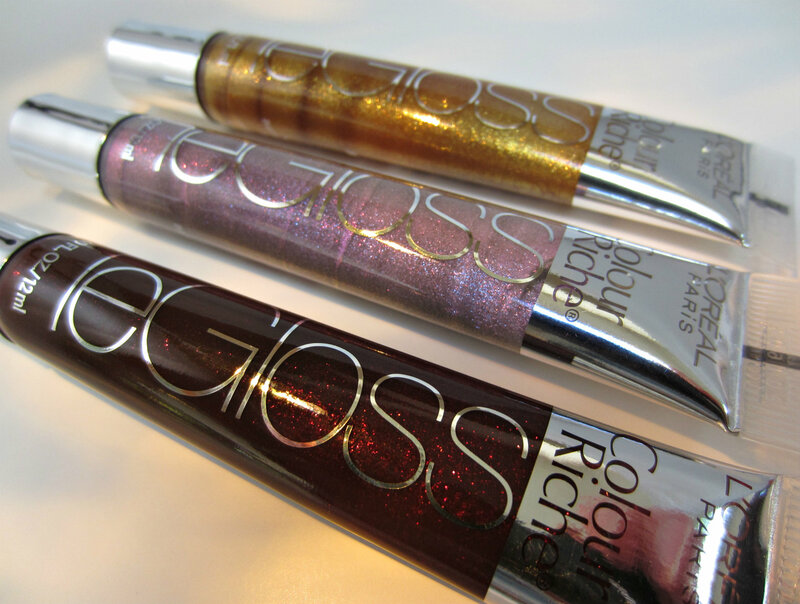 Have you spotted this collection yet? Let us know what you picked up! 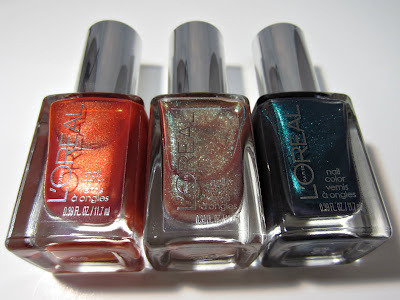 On a similar note, has anyone seen a Color of Hope Collection from L'Oreal this year? I have not, and I can't find any information about one, so perhaps they aren't doing one. I was hoping for a standout polish like Owl's Night from last year but unfortunately, I'm underwhelmed. Looking forward to seeing swatches of those lippies though; I'm really digging the dark, vampy lip trend. Those are pretty - I'll have to look for them! I need to go seek out some of those eye quads. Sadly, I am pretty saturated with polish. Can't even get through what I have. 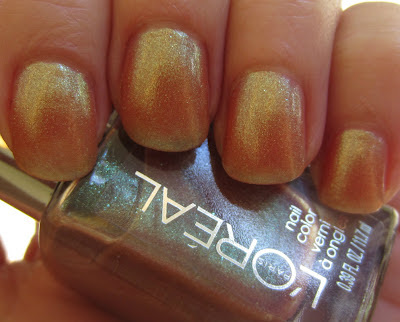 I just layered The Temptress' Power over China Glaze's Exotic Encounters and the effect is pretty amazing. 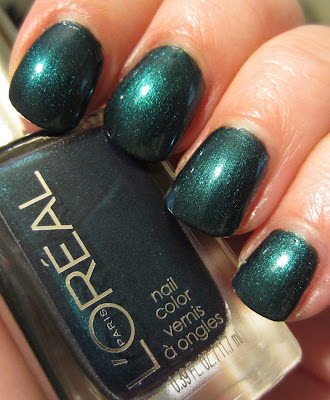 It really brings out the green shimmer...love! This collection has not hit my Rite Aide nor the Walgreens that is 60 miles from home for me (but was there to get pharmacy). 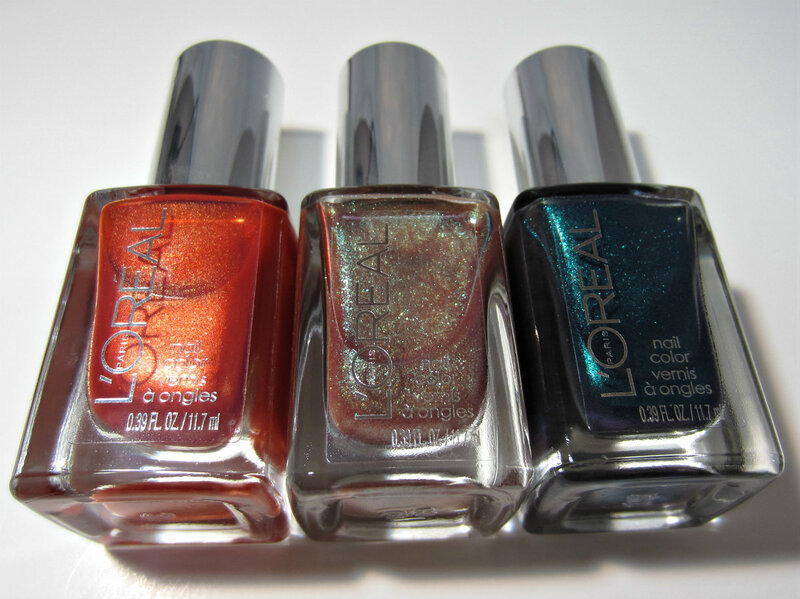 It's been interesting to see L'Oreal come out with some real hits of late - I hardly gave their polish a first let alone 2nd look for eons. I had only 1 bottle I bought back when the blackened burgandys hit hard for the first time and I could not wear plain black creams. I have Owl Night from last year - the British ones I could not find the 2 shades I wanted (released early Aug 2012). All the small sets were gone of the 2 shades I wanted. Have not had any of the Color of Hope show up here either...looked on their various web sites and don't see anything for a release on one this yr...so my guess is none...sad as I think it's something they should do. This fall would be a great yr to do one with color being so prominent in fall over brown, gray and black...we have more than the traditional purples and teals. Pinks are even in a # of fall collections (polish and fashion)...and there are a whole range of pinks that no polish co has tried to use for breast cancer awareness...I am thinking of fuchsias and the likes of Orly's Preamp from this fall's release...pink polish got a bad rap for a lot of yrs - so maybe with lack luster sales of other pinks and other BCA campaigns, L'Oreal bailed - thanks for hunting these down and giving us swatches.